Controversy surrounding Senator Fraser Anning attending a far-right political rally in Melbourne in early January has highlighted how those concerned, in collaboration with their neo-Nazi admirers, are still able to make a nasty, unpleasant contribution to political discourse in contemporary Australia. International allegiances based on race and ethnicity and their use by US imperialism. Both factors throw considerable light upon secretive class and state power networks, and the links they have to the far-right. Such affiliations have enabled the Australian far-right to gain access to class and state power, and hide behind veils of respectability. Anning is presumably well aware of the elite patronage systems linked to class and state power having been propelled into the Australian Senate after winning only nineteen primary votes in the last federal election; following the disqualification of One Nation Senator Malcolm Roberts, Anning gained access to parliament through the small print of the Australian constitution. Despite his unusual path to Parliament, he has provided vital support for the present right-wing Coalition government in Canberra. Hansard records reveal Anning has voted for the Coalition ninety per cent of the time, propping up a decrepit alliance of right-wing pro-business types. (12) Both former Prime Minister Turnbull and present PM Scott Morrison, for example, openly accept the support of Anning. They, and figures such as cabinet member MP Peter Dutton, have remained curiously silent over some of the other political activities pursued by Anning. The Coalition government in Canberra has remained loyal to the US and followed their directives which include the new Cold War with China, an issue also central to far-right political positions. (13) It is not difficult to find examples of shadowy US influence in Australian politics. 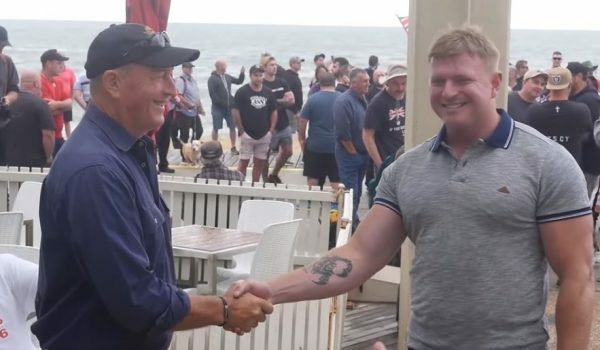 When Anning attended the hundred-strong St Kilda rally in early January, for example, he revealed the legacy of a US-led covert operation over four decades ago in Vietnam. It dated from the US support for puppet-regimes in South Vietnam, which were used to support 'US interests' in Asia. Despite a huge military presence in Vietnam, however, the US lost the war; the problem led to massive asylum-seeker issues. Those Vietnamese government officials who had supported US programs were provided with priority resettlement elsewhere: some opted to settle in Australia. They were settled within the wider Vietnamese communities. It is, therefore, no surprise that US-led defence and security organisations also sought continued assistance from their former 'intelligence assets' to monitor Vietnamese communities and to continue to push Cold War-type agendas into the modern period. It is interesting to note that while the main Vietnamese community in Melbourne actively distanced itself from the far-right rally in January, Anning was photographed 'posing with two men bearing the flags of the former South Vietnam'. (16) More than forty years after the fall of South Vietnam, pro-US elements still actively supported recent far-right political initiatives from inside the ethnic minority. Despite appearing quite comfortable associating with known Nazis, Anning has been noted as 'a big supporter of Israel' who has used his Senate position to 'support Israel'. (17) Israel, has been, from its establishment in 1948, a major strategic hub for 'US interests' in the Middle East. Anning, furthermore, has referred to himself as a 'supporter of the Jewish community'. (18) Clearly such a political position would appear incongruous, raising serious questions about the nature of the political exercise Anning is really conducting and on whose behalf. Like many political exercises conducted from a basis of expediency, the one pursued by Anning would now appear to have seriously backfired; light has been thrown upon some far-right baggage and support for former white supremacist Apartheid South Africa and Zionism. Racialism, and everything which is associated with it politically, remains central to far-right thinking. Far from having a confused political position, Anning has shown that supporters of Israel are not among the oppressed and nor are they victims of the far-right, but rather an instrumental and organisational part of the problem. Today, supporters of Israel are not fleeing persecution and discrimination, they are the perpetrators of similar behaviour toward the Palestinian people. The political shift which has taken Israel from victim status to the right-wing of the political spectrum has also been accompanied by other military, defence and security considerations. There is little ambiguity in the position Israel has chosen, although they remain highly competent with the act of denial. Their support for Apartheid South Africa has revealed the racialist standpoint of Zionism and its ability to prop-up a strategic part of US-led global military and security provisions, linking the South Atlantic with the Indian Ocean. Far from weaving a secretive tangled web of political intrigue based upon expediency, Anning would appear a rather hopeless figure and completely out-of-his-depth in Canberra or elsewhere in Australia. Monitoring the likes of Senator Fraser Anning, nevertheless, has further revealed how secretive class and state power networks, including the far-right remain functional in contemporary Australia. The monitoring job has also been made far easier having someone like Anning in the Senate. His level of political sophistication has not been particularly challenging. While progressive, sensible people should be on their guard, those who actively oppose racism, racialism and discrimination can, nevertheless, remain optimistic: the St. Kilda far-right rally only attracted a hundred supporters, while the counter-demonstration was at least double the size; Anning has already acknowledged he is unlikely to be able to retain his seat after forthcoming elections, where he needs to attract over 400,000 votes, a far cry from the nineteen numb-skulls who put him there. He will soon be joining the ranks of yesterday's men. 1. Senator bills for rally trip, admits he's doomed, Australian, 7 January 2019. 4. Hate Symbols show far-right on march, Australian, 7 January 2019. 6. Far-right figurehead for real Senate high-flyer, Australian, 8 January 2019. 8. The Australian League of Rights, A Study in Political Extremism and Subversion, Andrew A. Campbell, (Victoria, 1978), Appendix C, Links with Parallel Organisations in other Countries, page 170; and Voices of Hate, K. D. Gott, (Melbourne, 1965), pp. 30-42; and, Benign spymaster built global network, The Age (Melbourne), 3 March 1998; see also, Ted Serong, Anne Blair, (Melbourne, 2002), pp. 128-196, which has provided reliable information from official sources about direct links between the Australian and US Defence Departments, their intelligence services and the Australian far-right. 9. Nazis claim their stamp on all parties, The Age (Melbourne), 13 July 1999. 10. Website: Welcome! This site is for your information on the One Holy Catholic Apostolic Church in this region with links to the rest of the world - This Ring Name site is owned by One Nation. 11. Voices of Hate, op.cit., page 38. 12. Morrison lashed 'repeat offender', Australian, 8 January 2019. 14. National Security Study Memorandum, 204, 1 July 1974, Partially Declassified, 11 March 1995, Dotpoint 1. 16. Anning not with us: Vietnamese, Australian, 8 January 2019. 17. Anning is no Nazi or anti-Semite: senator, Australian, 9 January 2019. 18. Morrison lashed 'repeat offender', op.cit., 8 January 2019. 19. Birds of a Feather: Israel and Apartheid South Africa – Colonialism of a Special Type, Ronnie Kasrils, Israel and South Africa, The Many Faces of Apartheid, Edited by Ilan Pappe, (London, 2015), pp. 23-24. 20. The Unnatural Alliance, James Adams, (London, 1984), page 85. If the Women Want, the World Stands Still!